This article is about the armored combat vehicle. For the liquid storage container, see Storage tank. Tanks, like cars, match the color of the player driving them. The tank is a heavy armored fighting vehicle. It is a mid-game vehicle with three weapons; an integrated submachine gun, a short range flamethrower and a powerful cannon that uses cannon shells. 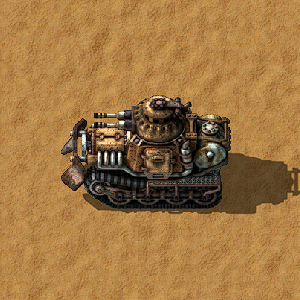 It, along with the car, are the two non-rail vehicles in Factorio. 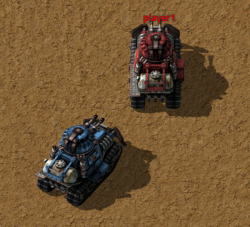 In multiplayer, it is possible for a player to enter a tank alongside another player. The passenger can take control of the weapons of the tank using a switch in the GUI of the tank, but cannot steer the tank. Since engine units can only be built in assembling machines, tanks (like cars) cannot be built from scratch by hand from their raw materials. If the tank is destroyed, the player gets ejected and not killed. Destroy 100 trees by impact. The tank is a strong fighting vehicle due to its large health pool and the very high damage of its main weapon, the cannon. Additionally, due to the ability to employ drones from within the vehicle, it can be used as a form of drone or capsule transport vehicle, with the player simply using capsules to fight their battles. The tank particularly shines in battle against Worms, as their unavoidable projectiles are much less of a problem for an entity with a high health pool. The tank lags behind in speed, however, compared to the player and the car. As a result, it may not perform as well in combat against melee enemies or enemies with shorter range than the player, as it has more difficulty dodging enemies. This may result in the tank being destroyed quickly, leaving the player in a tight spot. It is possible to use throwable items such as grenades, poisons, and follower robots while riding in the tank. This makes it possible to perform drive-by attacks on large bases with a reasonable area of effect. Since grenades and tank are available fairly early in the game this enables an effective means of early game expansion before the better known turret creep strategy becomes viable. The tank is very robust, and unlike the car can move through and destroy trees without taking damage. Even when not moving, simply driving into an entity is enough to damage it. This can also be employed as a weapon against enemies, although certain enemies and structures (nests in particular) will deal high damage to the tank in the process, requiring repair after skirmishes. The tank is slower than the car and can be rotated in place while standing still, unlike the car. The speed and, in particular, responsiveness of the tank can be improved somewhat by burning better fuel: The tank, like all other vehicles, gains top speed and acceleration bonuses when running on solid fuel, rocket fuel and nuclear fuel, as opposed to wood or coal. The bonuses are +5% / +15% / +15% top speed and +20% / +80% / +150% acceleration for solid fuel, rocket fuel and nuclear fuel, respectively; wood (and wood products - see Fuel) and coal both yield the base level of top speed and acceleration. Capsules can be used while inside the tank, including combat robots. Construction robots, including those from a personal roboport within range of the tank, will repair damage if repair packs are available. Also, logistic robots can still refill the player's inventory. Decreased tank machine gun damage to match the player held submachine gun. In multiplayer players can now ride as passengers in cars/tanks. Tanks no longer take miniscule amounts of damage from hitting trees. Increased health from 1,000 to 2,000. Added a +100% damage bonus and a +5 tiles range increase to the tank machine gun. Increased tank machine gun range to 20 tiles. Running biters over in a tank in peaceful mode will now anger them. When attacking a player in a tank, the tank will be attacked instead of the player directly. Tanks can now turn in place. Tank inventory can now be filtered. Tank ammo inventory is refilled from the trunk and player inventory when exhausted. Added a small scorch mark when heavy weaponry like the tank cannon fires. This page was last edited on 24 April 2019, at 14:37.